Welcome to Vancouver (please arrive by 11am). Embark on your luxurious seven night voyage with Princess Cruises. Watch for wildlife from your Verandah Stateroom and enjoy included drinks with dinner each night. Cruise northwards on board your elegant cruise ship. A welcome lunch is a great way to celebrate your adventures at sea. Some of the glaciers of College Fjord are 40 storeys high and tower over even the largest cruise ships. Celebrate the end of your cruise with a farewell dinner. Visit Alaska’s Wildlife Conservation Centre. Enjoy a jet boat ride before your Special Stay at Mt. McKinley Princess Wilderness Lodge. Optional flightseeing over Denali, with glacier landing (additional expense, subject to seasonal operation. Replaces jet boat ride). Cruise into the heart of Alaska on the ‘Discovery III’ Sternwheeler. See a bush floatplane take off, meet champion sled dogs, and discover village life. 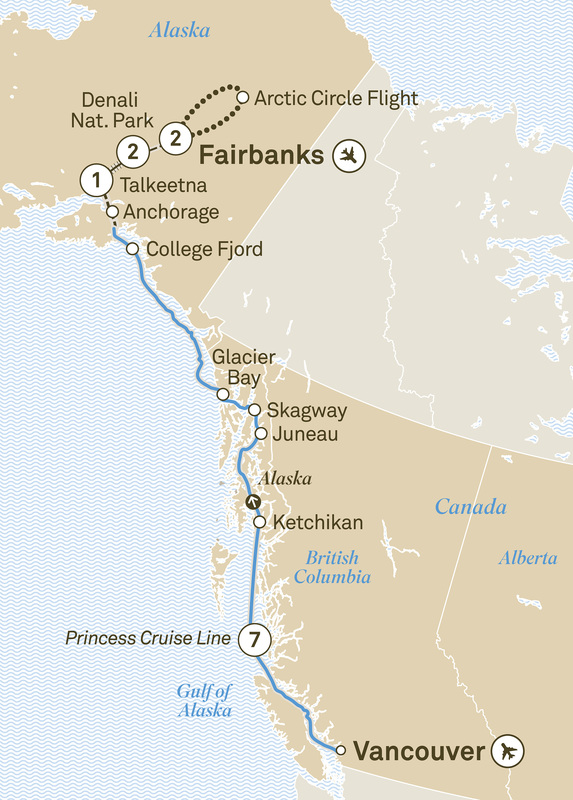 Stay two nights at Fairbanks Princess Riverside Lodge. Experience the thrill of crossing the Arctic Circle by air and receive a certificate to prove it. Stop at a wilderness community for a fascinating insight into the history of the region and life today. Truly a once-in-a-lifetime adventure.